Ideally we would spend our entire summer frolicking in Lauren Moffatt’s to-die-for prints and beachy dresses, and now we finally can! 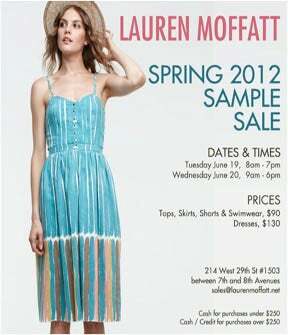 Yes, our day (and summer days) just got better with Lauren's...wait for it.... spring '12 sample sale. With skirts, shorts, and swimwear on sale for $90 and dresses for $130, how could we resist? Head over and get your hands on some fabulous floral dresses or a pair of printed shorts just begging to be packed for a trip to the Hamptons. Bring cash for purchases under $250, or really go big and use a credit card for anything over $250. Sorry, Visa, looks like you're gonna get a workout. When: Tuesday, June 19, from 8 a.m to 7 p.m; Wednesday, June 20, from 9 a.m. to 6 p.m.
Where: 214 West 29th Street, Suite #1503 (between 7th and 8th avenues).